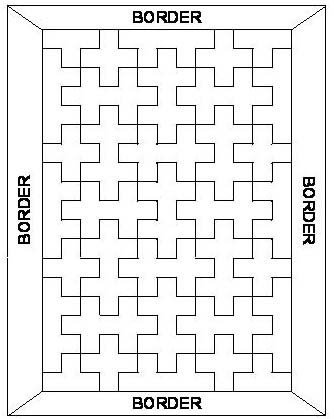 This is the method I plan to use for my border. You will also need 4 stitch markers. One of them should be distinctively different from the other three. If you cast on/started with 40 stitches for each of your squares, pick up and knit 20 stitches along each of your blocks starting on one of the short sides of the afghan. If you started with a different number, then use half of that number. I will be picking up 20 stitches along the edge of each block. There are 13 blocks. Therefore, I am picking up 260 stitches total along the short edge. Place a marker. Now, pick up and knit along the long edge: 20 stitches x 19 blocks equals 380 stitches. Place a marker. Pick up and knit 260 stitches along the remaining short edge. Place a marker. Pick up and knit 380 stitches along the remaining long ege. Place the marker that is distinctively different here. This is the beginning/end of your round. Total: 1280 stitches. Yes, I know. It's a lot of stitches. I'm okay with that. Round 1: M1R (make 1 stitch leaning to the right) http://youtu.be/IlPQBhZ31B4, then knit to the marker, M1L (make 1 stitch learning to the left). Slip the marker. Repeat to end of the round. Round 2: Purl all the stitches, slipping the marker when you come to it. 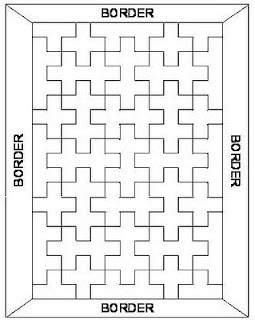 Repeat Rounds 1 and 2 until the border is the width you'd like. End with a Round 1. Bind off loosely. You can bind off in knit or purl, your choice. If you'd like your garter stitch border to be striped, change colors whenever you like, but always on Round 1. I-cord: http://youtu.be/jcGj6tpqeJA You can knit an I-cord and then sew it around the outside of the afghan, easing it around the corners. Attached I-cord: http://youtu.be/H0PILVw6eO8 or http://www.purlbee.com/attached-i-cord-tutorial/ You can find other tutorials for I-cord and attached I-cord by searching online or in some knitting books. You might like to add a lace border. Many designs can be found in stitch dictionaries. You can attach the border while you're knitting or knit it separately and sew it on. If you know how to crochet, you can do a border using that method. I don't crochet but I understand that this method is quick and quite easy. Some may like to add a fringe on one side, or all 4. Look in books such as Nicky Epstein's book about borders for ideas. Once you have finished the border weave in the yarn ends and you're finished!